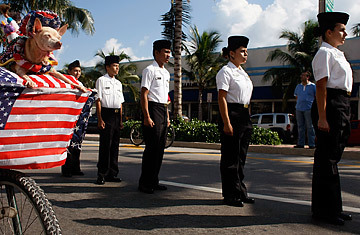 Junior ROTC cadets march in a parade during a Veterans Day ceremony in Miami Beach, Florida. The focus of the fight, on a growing number of campuses, is the Reserve Officers Training Corpe (ROTC), which was kicked off most of the Ivy League campuses (or made an extracurricular activity) during the antiwar protests of the 1960s. The Yale Political Union concluded this fall that the university ought to bring ROTC back to campus, a move some students said would help the school live up to its motto: "For God, For Country, and For Yale." While many of the objections are based on the military's "don't ask, don't tell" policy on gays, op-eds and letters to the editor in the Yale Daily News  which endorsed the idea  argued that allowing ROTC back would encourage debate over the policy, rather than indicate an endorsement of it. At Harvard, meanwhile, where students can participate in the ROTC program at neighboring MIT, the undergraduate council in April passed a bill  jointly presented by the college Republicans and Democrats  called "Supporting ROTC," urging the school to list ROTC courses on students' transcripts and say that it "is proud of [students'] service to the nation" in its official description of ROTC. But nowhere is the debate more pronounced than at left-leaning Columbia University. Ever since September, when both Presidential candidates came to the Manhattan campus and voiced their support for ROTC during the TIME-sponsored ServiceNation summit (John McCain's remarks incited boos while Barack Obama's elicited baffled silence), controversy over the issue has roiled the campus. Students at Columbia, which once bred more officers a year than the U.S. Naval Academy, even went so far as to conduct a poll at all four of the university's undergraduate colleges on whether to bring back the military officer training program that was booted from campus in 1969 at the height of anti-Vietnam furor. While students voted 54% to 46% to keep the ban in place, ROTC advocates say the tenor of the debate was more revealing than the ultimate result. Take Learned Foote, for example, a sophomore who is gay but supports ROTC as a way to bridge the gap between civil and military service. "If you push [the military] off of campus and wait for others to do that work, I don't think that's as effective as saying, 'OK, we're going to put Columbia students who do have progressive values into the military and change it both from the inside and from the outside,'" he says. "'Don't ask, don't tell' is only a symptom of a larger issue, which is a lack of engagement with the military." ROTC supporters point to the debate at Columbia and its focus on "don't ask, don't tell" as a sign that students no longer have strong objections to the military more generally  and therefore would be receptive to inviting the program back if the policy were repealed, something more than 100 retired generals and admirals called for in November. Advocates have long held that encouraging a military presence on campuses  particularly in cities and the northeast  could even out some of the geographic and economic disparities in military service. And there are good reasons to want the military at Ivy League schools, traditionally breeding grounds for future political leaders. According to research by Peter Feaver and Richard Kohn, who in 2001 edited Soldiers and Civilians: The Civil-Military Gap and American National Security, since 1816 the more veterans there have been in the upper echelons of government, the fewer military actions the U.S. has taken. Back in 1991, veterans comprised half of the House of Representatives. Now they account for only a quarter of its members. In the more immediate term, engaging with the military could benefit both civilians and soldiers. For students, Foote contends, interacting with more future soldiers in classes and dining halls would discourage the view of the military as a monolith  or a political entity. "Having the students within the military at Columbia reminds us that something like the Iraq war was not done because of the military but because of the politicians we elect," he says. At the same time, notes Allan Silver, a Columbia sociology professor who supports the return of ROTC despite what he calls its "abhorrent" policy on gays, having future soldiers live side by side with students who sometimes criticize them would encourage critical thinking and thereby strengthen the military. "At ROTC programs in Virginia, there are no objections," he says. "Let [soldiers] feel at home in Stanford and the Bronx, and we'll have a better military and a better society." Above all, says Silver, inviting the program to return would make a statement to the military that the campus has changed since the '60s. The message, as Silver puts it, is clear: "Enough with the culture war." For now, though, the debate at Columbia remains largely symbolic. University President Lee Bollinger has said he won't ask ROTC back until "don't ask, don't tell" is overturned. Moreover, even if Bollinger did let ROTC on campus, the Pentagon may not allocate funding to start training there, according to spokesperson Eileen Lainez. Students who are so inclined can continue to participate in Army ROTC and Air Force ROTC at nearby colleges. Read "Colleges Learn to Navigate the Credit Crunch"